If we work hard, can we be OK with any outcome? Of course we can, but we see that it requires some mind detox to reach that point. We need to reach a form of higher perspective, to see the bigger picture. That’s when we don’t take things personally, and we step out of our own doing, more like if we were observing it instead. That’s how the best leaders describe their work; it’s not personal! When we can be detached from what we do and the outcome of what we do, but still work hard for it to happen, we are detached from the future. Then any outcome is OK, but we still work 100% towards the one we want the most. We “use” the future, or our thinking mind (a great tool), to lead us towards a direction, but we are detached from the goal. The objective is doing it, not the goal. This is accepting any outcome and it is the only way we can be at peace. The world is constantly changing, new factors occur and we can’t control the future. It’s letting go of the expectations and therefore the disillusions and accept that we can only try to predict, but it is nothing but our limited mind trying to minimize the risks. It’s accepting things as they are and doing our best anyway, hopefully having fun, exploring life and learning while doing it. 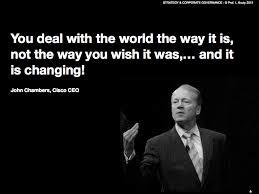 It’s a mantra of John Chambers, CEO of Cisco, one of the worlds best leaders. Detachment is the foundation in many philosophies. That’s when we realize that the journey is more important than the goal, as the saying goes. And even if we don’t reach the goal we sat out, something else comes instead that we might not even have been able to imagine. Choose your direction, let the map be your goal not your destination, and accept any outcome. Then start walking again and make a new map. Notice how productive and creative you get. Detach from yourself, observe yourself and let go, so you can learn and accept your wants and wishes. Have them but don’t let them have you. When we are detached, free of the outcome, we feel how the creativity and productivity starts energizing us. 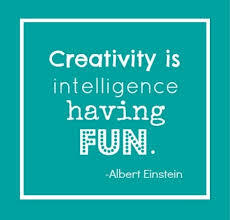 Oh, and have FUN! ‹ PreviousGive It 100% and Be Happy If It Doesn’t Happen! Next ›Creativity Arises When Fear is No longer a Reason to Stop.